Our 5-step Getting Unstuck process, based on decision science, has helped thousands of people in career paralysis to find their best direction and transform their working lives. 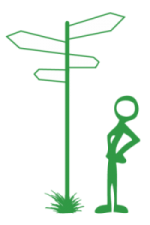 We help people who feel stuck in their careers and who want more meaning, purpose and direction in their work. Our team of expert psychologists specialise in career change at any age and from any career. We help people to get ‘unstuck’ in their career and to move forward with purpose, based on a clear understanding of their skills, strengths, values and life priorities. As psychologists we also help our clients understand and manage the difficult thoughts and emotions which can keep them stuck. Whilst we don’t promise to remove your anxiety, we’ll give you skills that will change your relationship to anxiety forever – and stop it from holding you back. We offer an objective 5-step process which helps our clients get unstuck, identify which direction would suit them best and move towards it. The process is logical, objective and offers a step by step approach. We think this is the best, most comprehensive career change process around as it is based on the very latest research in psychology, behaviour change and decision science. In general, clients sign up for the full Getting Unstuck process, which consists of 5 face to face coaching sessions, plus materials and e-mail support. Alternatively, we offer one-off coaching sessions if that suits you better or if you need help with only one particular part of the process. We don’t promise to identify your ‘ideal’ job – this might not even exist. And we don’t promise to banish your negative thoughts. But we do promise to help you get unstuck from where you are, to make the best possible decision on your future direction and to get into action, even when it gets tough. If you want to get unstuck and move forward with purpose, the first step is to drop us a line. You’ll have an introductory call with one of our Career Psychologists and after that we’ll give you a proposal for how it will work, tailored to your requirements. My renewed focus on the most important things in my life as well as my career – and to do so in a way that is smart, brave and exciting – is largely thanks to their understanding, presence and ongoing support.